Even as Italians slowly continue to move out, the famous Arthur Avenue in the Bronx remains the destination for red sauce, for New Yorkers in the know. Like, for example... us! And luckily, we're in a sharing mood: here’s literally everything you need to eat/drink on Arthur Ave.
Hit the Arthur Avenue Retail Market (built during La Guardia’s reign), and mosey on over to Greco’s (née Mike’s Deli) of Throwdown fame. There, you’ll want to gorge yourself on an overstuffed hero. But outsmart Bobby Flay and skip the eggplant parmigiana in favor of the borough’s most delicious Italian combo, packed with meats and provolone. Mike Greco and his counterman are brusque and impatient, but the sandwich is worth it. Full Moon is often billed as the hood’s top slice shop, but, don’t (don't don't don't... don't) believe the hype. The pan-baked, Sicilian-style slices at this Retail Market café are the neighborhood’s best. The selection rotates on a daily basis (you get what you see), but it’s best to follow our advice no matter what’s available. 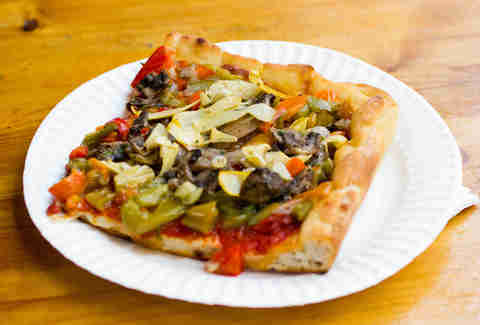 Go big or go home with one of their over-the-top specialty pies, like the mushroom, roasted red pepper, and artichoke salad slice. If you’re thirsty (hahahahaha "if"), hit The Bronx Beer Hall. It’s got an excellent selection of beers, with an emphasis on local brews and Bronx producers like the award-winning Gun Hill. Don’t let the signed photos of politicians and the dim lights dissuade you. This deli is a favorite among Fordham students for its belly-hugging heroes, but that's not what you’re here for. Skip the meat case and head straight for the shelves. Owner Gianluca Paciullo stocks his store with real deal balsamic vinegar, Nettuno anchovies imported by the Bronx’s Gustiamo, and pastas you won’t find at Eataly. Yes, the prices are more expensive than Teitel’s (where you’ll find good quality pine nuts and very low prices), but no one else stocks as many products like this up here. This sardine can of a store -- overflowing with imports, meats, and antipasti -- gets packed real quick on weekends and holidays. You’ll know why after you sneak a peek through the window behind the cashier, where you’ll catch owner Orazio Carciotto and his son Carlo stretching curds by hand. Yeah, everybody and their grandmother makes mozzarella around here, but no one’s can compare to the sweet, creamy, springy nirvana of Casa’s. 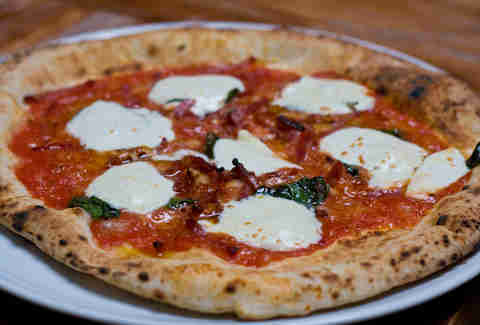 Fresh, salted, or smoked, it’s some of the best in town, and so is their made-to-order burrata. Grab some bocconcini to snack on while you’re heading to your next stop. 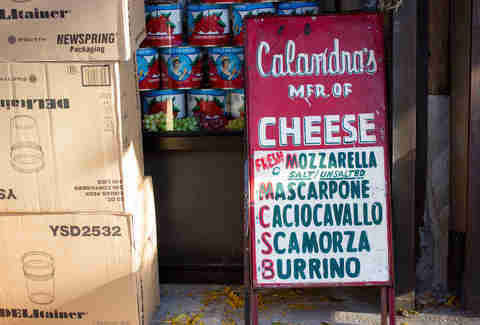 Stepping into Calabria is like booking a ticket back to the Old World. The storefront doubles as a meat cave, with sausages hanging from the ceiling like salty, delicious stalactites. The musty, meaty soppressata (get the extra hot!) 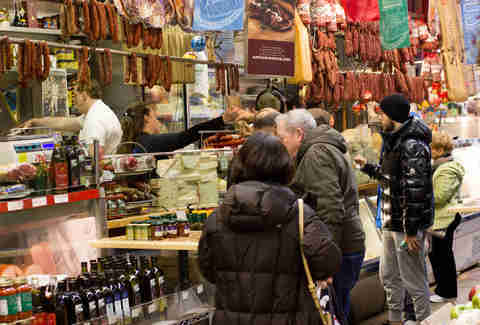 is the store’s hallmark, plus there's the a pound or two of imported culatello -- a cured meat that puts prosciutto to shame and is always a great move. But their secret weapon? The spreadable, chili-packed 'nduja. This 187th St wine store has dozens of bottles from all over Italy and ends up being a great place to learn about Frascati, a dry and clean wine created two millennia ago, plus Italian reds like Aglianico, Corvina, and Gaglioppo. The third-generation owners here are as knowledgeable and passionate as ever, bringing in goods like California sea urchin when it's in season and an Adriatic bounty throughout the year. 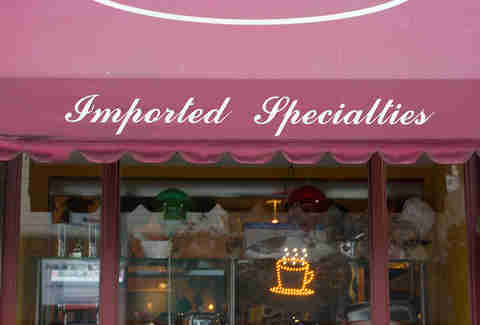 Plus you can stock up on scorfano (a spiny fish preferred for stews), fresh anchovies, and vongole. 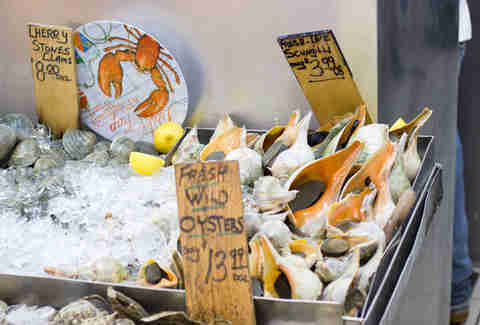 Just don’t forget to slurp down a couple oysters street-side, first. Eight decades in, the Borgatti family is practically Bronx royalty. Currently helmed by the stern and devoted Chris Borgatti, grandson of the shop’s founders, they sell ravioli, manicotti, spinach pasta, and egg noodles. Everything is cut by hand, and when you finally make it the counter, you’ll get to designate your noodle thickness. 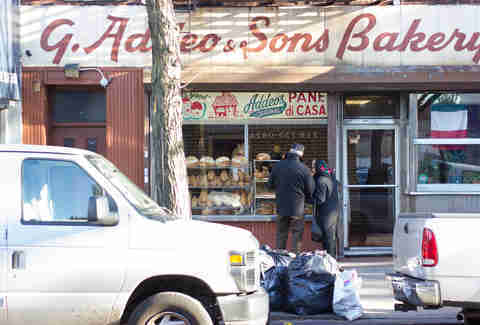 Locals and Saturday Italians alike fight over who makes the best loaf on Arthur Ave. Well, the answer is Terranova, where they bake a crusty Pane di Casa that will haunt your dreams. But that’s not all. 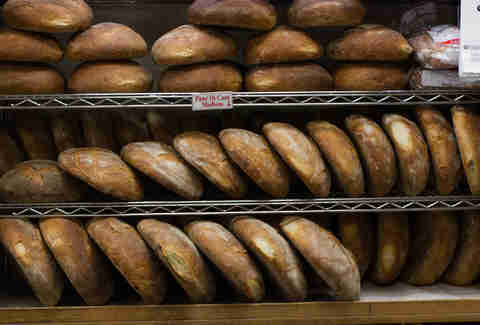 You’ll also find top notch loafs like tangy sourdough, focaccia, and a very, very good olive bread. Terranova is the best bread generalist, yes, but come sandwich time, it’s best to do as Casa Della Mozzarella does and put this bakery’s sesame seed loaf to work. Crusty, nutty, and chewy, it’s the vehicle for the hero of your dreams. Unless you prefer soggy and leaden shells (dude, you don't), never accept anything but a cannoli filled to order. Madonia does it right, piping ricotta into their flaky shells to order. 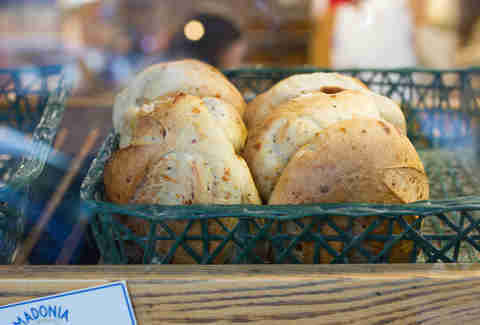 They also draw a crowd thanks to their specialty loafs, the best of which is the cheese bread, adorned with chunks of provolone spun into the dough and flecked with black pepper. Butchers have disappeared from many New York neighborhoods, but not on Arthur Ave, where they are blessed with, three, count ’em, THREE that would make any neighborhood a destination. 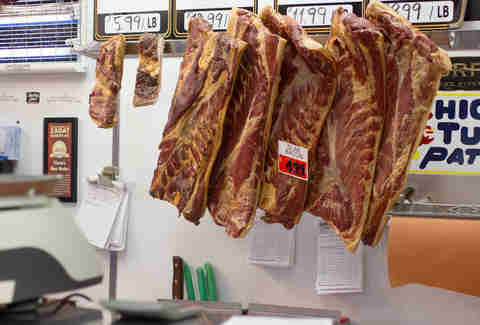 Each sells a wide selection of reasonably priced, high quality meats. We’re not just talking about pork, chicken, and beef, here. We're also talking about Cornish hen, duck, baby goat, rabbit, lamb, off cuts galore, and much more. 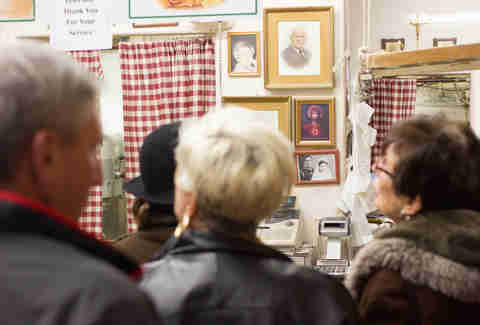 For the warm service, quality, and fresh sausages, Vincent’s is the move. Their cotechino (a sausage made with warm spices, off cuts, fat, and skin) is worth the trip alone. At his second restaurant, Roberto Paciullo is serving the pies of his native Salerno, which means a crisper Neapolitan without the soupy center. The dining room is cavernous and the kitschy trattoria décor is borderline Epcot. After you dig into the Riccardo, topped with butternut squash puree, smoked mozzarella, and spicy pancetta, though, you won’t care. For classic red sauce, you’ll want to skip the old timers (we love Mario and Dominick’s, but…) for a relative (and relatively under-appreciated) newcomer. Better cooking is the only secret at Tra Di Noi, which is, currently, the best restaurant on Arthur Ave. The dining room, with its red-checkered linens, looks like it was inspired by Louis' Italian American Restaurant. 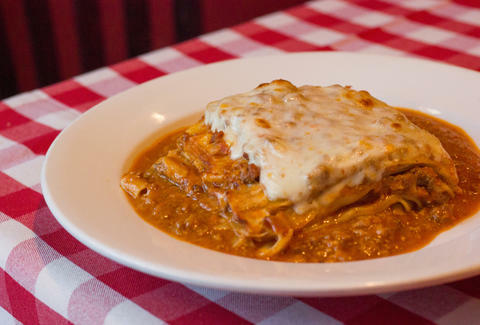 But the killer lasagna Bolognese is everything you wished mom’s could be. It’s substantial and hearty without being too rich, with tender sheets of pasta and just enough of that meaty, tomato-y sauce. Don’t sleep on the seafood, either. Chris Crowley is a freelance journalist with an overzealous appetite. His work has appeared on Grub Street, Serious Eats (where he wrote a column about the Bronx’s restaurants for over two years), Punch, Narratively, and more. Follow him on Twitter.